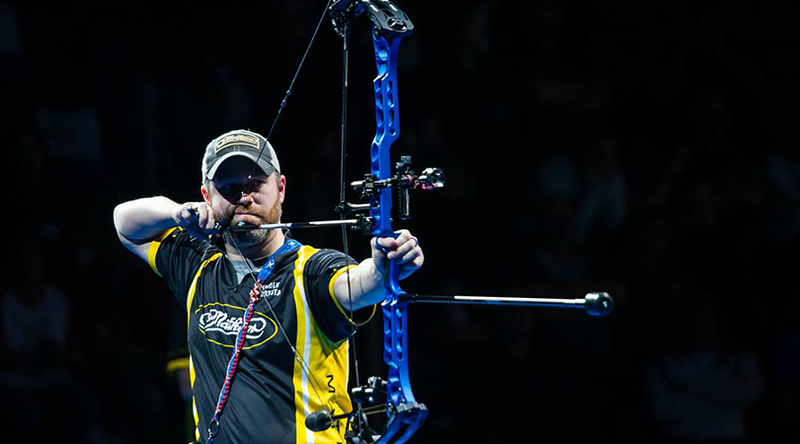 The world’s most decorated archer, Braden Gellenthien, added more hardware to his collection over the weekend at the fourth stage of the Indoor Archery World Series that took place in Nimes, France, with a commanding performance and gold medal finish. “When a match is down to the wire and I need my last shot to hit true, I trust Scott Archery releases and Custom Bow Equipment sights to come through,” said Gellenthien. Qualifications set the stage for bracket rounds in record-breaking fashion. With the compound men’s cut set at a first ever 590 line, competitors needed to drop less than 10 points to be certain of finishing among the top 32. Seeded 10th, Gellenthien bested Italy’s Sergio Pagni, followed by fellow American Jesse Broadwater, and finally France’s Pierre-Julien Deloche in the quarterfinal to head to the gold medal match where he topped Kris Schaff by a close score of 145-144. Gellenthien returns to the US just in time to gear up and travel to Lancaster, PA for the annual Lancaster Classic taking place January 25-27.